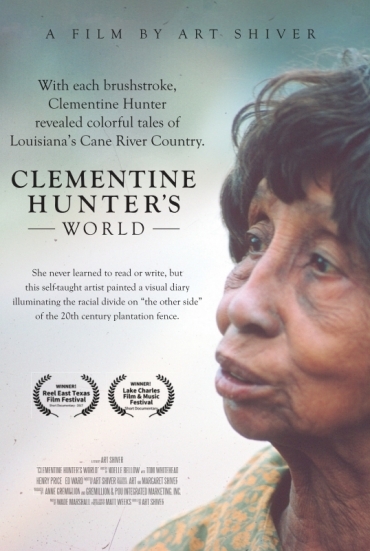 A locally produced film documentary, “Clementine Hunter’s World,” was screened in the Oprah Winfrey Theater at the National Museum of History & Culture (NMAAHC) on March 24. A panel discussion featuring the filmmaker, Art Shiver, along with Tom Whitehead, Henry Price and Molly Baker followed. This screening is in conjunction with the NMAAHC’s current exhibition, “Clementine Hunter: Life on Melrose Plantation,” which is on view in the Visual Art Gallery until Dec. 19. About the making of the film: The writer and director of the film, noted author Art Shiver, was determined to create the entire documentary within the artist’s home state of Louisiana. He chose Anne Gremillion and her firm, Gremillion & Pou Integrated Marketing of Shreveport, La., to produce the film. About the film: “Clementine Hunter’s World” is a short documentary on the life and work of self-taught, African-American artist Clementine Hunter. “Clementine Hunter’s World” combines vintage photographs with Hunter’s images to bring her story to life. Clementine Hunter’s vast collection of painted memories shed new light on the untold stories of African-American workers. With each creation, she revealed colorful tales of mid-century plantation life in the Cane River Country. About Clementine Hunter: From the time Clementine Hunter first picked up a brush in the late 1940s until her death in 1988, she painted thousands of images recalling her life on a 20th-century plantation. Southern plantation history is often white-centric, but Hunter’s art records and recalls life among the African- American workers. As the artist quietly painted her colorful pictures, initially by the light of a kerosene lamp, rumblings of unrest were just beginning to awaken Americans to the changes coming in civil rights. Unaware of these happenings, the self-taught African-American artist quietly painted a visual diary of plantation life in Melrose, La. She painted her life as she knew it, and in doing so, left a visual diary that sheds light on the other side of the plantation’s racial divide. Today, paintings she sold for pennies sell for thousands of dollars and hang in private collections and prestigious galleries around the world. Additional contributors included: Matt Weeks as director of photography and editor; Noelle Bellow as moderator; Henry Price as historical commentator; John W. Gayle as the voice of Francois Mignon; Nathan Pizar for motion graphics; Wade Marshall as composer of the original soundtrack; Jared Navarre as photographer; Brad Campbell for graphic design; Chris Lyon as production supervisor; Alec McCommon, Clint McCommon and Jeremy Spring as production crew; Allison LaCour for hair and make-up. Work on the film began in early 2016. This film has won first place for a short documentary at both the Lake Charles Film Festival, in Lake Charles, La., as well as the Reel East Texas Film Festival in Kilgore, Texas.